It’s one thing to be an NHL affiliate, and it’s another to be competitive. 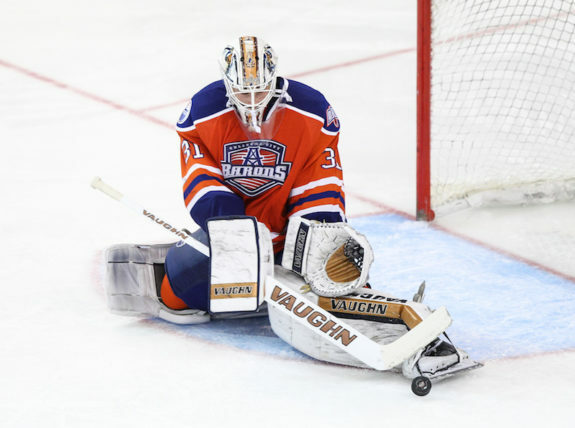 That’s the hard lesson the Edmonton Oilers’ farm team, the Bakersfield Condors, have learned in their last two seasons. Since Edmonton moved their AHL affiliate from Oklahoma City to Bakersfield, the team has yet to make a playoff appearance. The last time any Oilers AHL affiliate qualified for the Calder Cup Playoffs was in 2014-15. The Oklahoma City Barons went 41-27-8 and finished with 90 points. Laurent Brossoit was a second-year pro backstopping that Barons team. Andrew Miller led the Barons in scoring with 60 points in 63 games. The rest of the notable names from that club included Brad Hunt, Anton Lander, Jujhar Khaira, Iiro Pakarinen, and Dillon Simpson. That team lost a seven-game series to the Vancouver Canucks’ affiliate, the Utica Comets. The Barons folded that summer due to financial losses and poor attendance. Edmonton then moved their ECHL affiliate in Bakersfield to the AHL. In two years, the Condors haven’t been a strong team in the AHL and have placed sixth in the Pacific Division in both seasons. With a plethora of new additions and veterans acquired through free agency, this year’s Condors could have better luck at making the playoffs. Edmonton went out and signed several AHL veterans to support the Condors’ lineup this summer. Ty Rattie, Mitch Callahan, Grayson Downing, Brian Ferlin, and Brad Malone were all brought in to shore up the offense. The most notable name on that list is Rattie. The 24-year-old was a second-round pick in 2011 by the St. Louis Blues and looked like a future top-six forward. Rattie was named the WHL’s most valuable player during the 2012-13 playoffs. He led the Portland Winterhawks to the Memorial Cup tournament. Things haven’t worked out for Rattie since turning pro, however. He’s now on his third NHL franchise after a pitstop with the Carolina Hurricanes. He had a rough year last year scoring just five points in 22 games, after putting up 46 in 62 games in 2015-16. Rattie’s a reclamation project for the Condors, and the hope is that he regains his offensive touch in 2017-18. He should be a focal piece for Bakersfield’s top six and their power play. 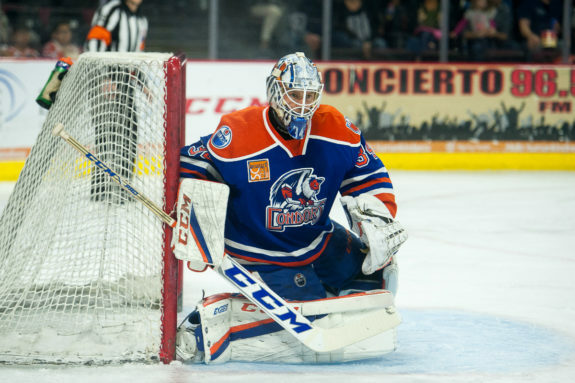 The Condors are weak up the middle with the departure of Lander, and the graduation of Khaira to the Oilers. Malone and Downing will both get looks as the team’s top two centers along with the returning Josh Currie. Malone, 28, has 176 NHL games under his belt but has more or less been a tweener between the two leagues. He had just 28 points in 71 AHL games last season. Downing, 25, played parts of the last three years with the Minnesota Wild’s AHL affiliate, the Iowa Wild. He finished last year with the Tucson Roadrunners but has yet to play an NHL game. Downing scored 26 points in 59 games last season. Frankly, this is concerning as the Condors don’t have a true first line center unless they give newcomer Joe Gambardella a chance to run with it. 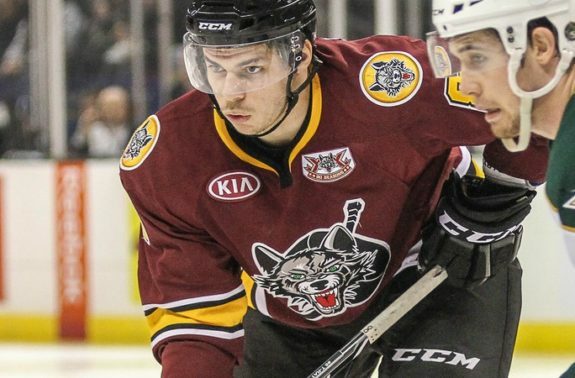 Bakersfield lost Jordan Oesterle in free agency when the defenseman signed with the Chicago Blackhawks. Oesterle was a solid piece in the Condors’ top-four pairings and a focal piece on their power play. In his place, Bakersfield signed Ryan Stanton and Keegan Lowe. Stanton is currently on the mend from a lower-body injury, but Lowe will get a heavy load of minutes on a younger Condors defense. If it wasn’t for Brossoit and Nick Ellis last season, things could’ve been a lot worse for Bakersfield. The two goaltenders kept the team in games they had no business being in. Now with Brossoit graduating to the Oilers, the onus falls on Ellis and this summer’s free agent signing Ed Pasquale. Ellis, 23, put in some stellar numbers in 2016-17 with a 2.69 goals-against average (GAA) and a .918 save percentage (SV%) in 34 games. Pasquale, 26, was the backup for the Calder Cup-winning Grand Rapids Griffins last year. If anything, Bakersfield will have competent goaltending once again. There’s still plenty of buzz about the Condors’ backend though. Ethan Bear and Caleb Jones are two highly touted prospects and have NHL written all over them. Bear scored his first career AHL goal in the season opener against the Stockton Heat. Naturally, that goal was assisted by Jones. On paper, the two blueliners give the Condors a quarterback for both power play (PP) units. Unfortunately, the Condors didn’t convert on any of their four power plays against Stockton. Bakersfield lost their opening game of the season 4-1 to Calgary’s farm team. They outshot Stockton 42-23, but there isn’t much you can do when the other team’s goalie, Jon Gillies, stands on his head. Mark Jankowski was an absolute force for Stockton as well with two goals, including the game-winner. Still, there’s plenty of promise on this Condors team. The current top line of Joey Laleggia, Jesse Puljujarvi and Malone were dominant with 12 shots on goal. Rattie looked energized playing on Bakersfield’s second line, and Will Butcher, who took a while to get going in the first game, had a couple of good late chances. There’s plenty of options on forward and the backend for head coach Gerry Fleming who’s likely going to be tinkering with this lineup all season. Guys like Bear, Jones, Puljujarvi, Rattie, Laleggia, and Malone are going to be the key pieces if Bakersfield is going to be successful. Offense is going to be the Condors’ biggest struggle, as it was last year. If the young players show some early sparks in their career, Bakersfield will be all right.